The Virginia Department of Environmental Quality has cleared the way for Dominion Energy’s 600-mile, deeply divisive Atlantic Coast Pipeline to begin construction here in Virginia. The agency has signed off on plans for how workers will manage erosion, sediment and stormwater along the route, which will cross hundreds of waterways and some of Virginia’s steepest terrain, the final approval the project needs before beginning to blast, trench and lay the pipe. The Federal Energy Regulatory Commission will issue the actual go-ahead for this work to start. The DEQ announced the decision just after 5 p.m. Friday. “These detailed protection plans specify engineering designs that will protect water quality during and after pipeline construction along the 300-mile project that stretches from Highland County to Greensville County,” the agency said in a statement. The approval came with a report to the State Water Control Board, a condition of the water quality certification the board issued for the project in December under section 401 of the federal Clean Water Act. The Virginia League of Conservation Voters wasn’t impressed, saying there’s little reason to think the failures to contain mud and stormwater that have plagued the separate Mountain Valley Pipeline, which is being built in Virginia now, won’t befall the ACP, though on a much wider scale because of its bigger footprint here. “The certification comes even as evidence mounts in Southwest Virginia that state regulations did little to keep communities safe from the Mountain Valley Pipeline, which has clogged some of our state’s cleanest waters with mud and sediment as crews trenched across steep, rugged, flashflood-prone terrain,” the group said. Two sitting FERC commissioners have said the massive gas project, which relies on subsidiaries of the companies building it to justify the need for the gas and comes with a 14 percent rate of return for the developers, isn’t in the public interest. “We simply don’t need hundreds of miles of costly and environmentally destructive gas infrastructure to keep the lights on in Virginia, but sadly, this approval is a step toward marrying Virginia to a future of higher energy costs and volatile fossil fuels for years to come while Dominion Energy profits handsomely at our expense,” Francis said. 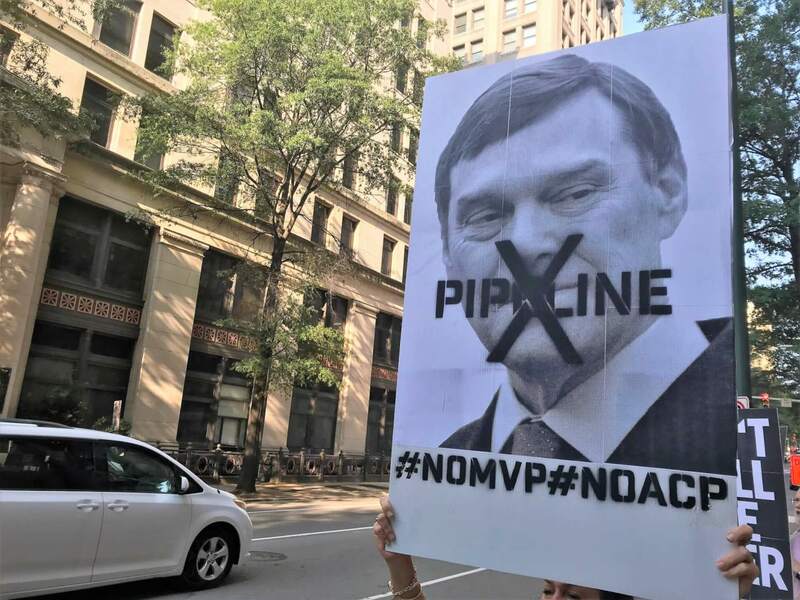 Work on the ACP began in West Virginia and North Carolina months ago, though it has proceeded in fits and starts because of court decisions that have invalidated several key federal permits. Construction on the Mountain Valley Pipeline has likewise been going on for months, though also subject to its own stoppages, racking up a steady stream of complaints from observers and neighboring landowners — and a violation notice from DEQ — that the project has been “hemorrhaging sediment,” fouling waterways and neighboring properties. Last week, precipitation from Tropical Storm Michael even floated two 80-foot sections of the pipeline onto a neighboring property. Environmental groups and other pipeline opponents, who warned state officials repeatedly that it would be all-but impossible to build the pipelines through steep terrain without dislodging vast quantities of sediment that would clog streams and cause permanent damage in some cases, were vindicated by the debacle that’s played out with MVP construction. It remains to be seen whether the agency has baked any lessons learned from MVP construction into the ACP plans. Melanie Davenport, head of the agency’s water permitting division, denied that MVP’s failures were delaying the issuance of ACP’s permits. We’ll see. There will be lots of people watching. And with the pipeline footprint so much larger, it will be harder to shunt their concerns off into a corner as has unfortunately happened with southwest Virginia landowners and pipeline monitors. Does Governor Northam care about environmental justice? A year ago this week, then-Gov. Terry McAuliffe took an important step in creating the state’s first Advisory Council on Environmental Justice. Heeding the principle that “protection of our natural resources applies equally to all individuals,” the council’s charge is to provide the administration with recommendations for action. It’s fitting that the council’s first priority was to examine the largest industrial projects proposed in Virginia in a generation – the Atlantic Coast and Mountain Valley pipelines, and in particular the 53,000-horsepower compressor station slated for a majority African-American community in Buckingham County. Northam and Secretary of Natural Resources Matthew Strickler have also made a lot of promises regarding the pipelines, saying they would not go forward unless they meet the strictest standards and that Virginia officials are doing everything possible to ensure those standards are met. Lt. Gov. Justin Fairfax went even further on the campaign trail last year, announcing his opposition to the pipelines. So it’s deeply disturbing that the administration has so far deferred much of the permitting to federal regulators under President Trump, who has no regard for either the environment or for social justice. It’s particularly frustrating because Virginia has clear authority to determine the fate of these projects under the federal Clean Air Act and Clean Water Act. So far, the administration’s actions on environmental justice fail to match its public statements. On August 16, the advisory council submitted a letter to the governor recommending that the state rescind its certifications for the two pipelines and suspend a decision on the air permit for the Buckingham compressor station “pending further review of the station’s impacts on the heath and the lives of those living in close proximity.” The 12-page, footnoted letter also urged formation of an emergency task force to thoroughly examine the issue. The same day, a gubernatorial spokesperson dismissed the council’s letter as a mere draft, still requiring an official vote.A week later, the council voted to reaffirm its letter and recommendations to the governor.For two months, there was no response. Then, at an October 11 council subcommittee meeting, a representative from Attorney General Mark Herring’s office said the council might not even exist because it’s unclear whether such bodies legally survive the transition between administrations. Regardless, he told them, the council would cease to exist October 31 – its one-year anniversary. 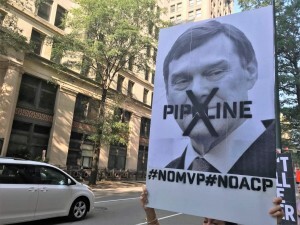 Northam can remove all doubt by immediately issuing an executive order continuing the council, and demonstrate his commitment to environmental justice by issuing a meaningful response to the council’s seven recommendations on the pipelines, none of which are off-limits to state action, including rescinding state water pollution permits. The governor has an obligation to act in the best interest of all Virginians. It’s been made abundantly clear the pipelines are not needed and pose irreparable harm to communities. Proceedings before the State Corporation Commission have revealed that Dominion Energy has never studied whether it needs new pipeline capacity to supply its power plants, and that it plans to pass some $2 billion of the Atlantic Coast Pipeline’s cost to its customers. So not only would the citizens of Buckingham be saddled with a compressor station that produces air pollution, noise, and the ever-present risk of explosion, Dominion’s 2.5 million customers across Virginia would be saddled with higher energy bills for an unnecessary project. The Northam administration has said a lot of the right things about environmental protection and environmental justice – but actions speak louder than words. Northam, Fairfax, Herring, and Strickler cannot say these things are important while they undermine the Advisory Council on Environmental Justice and ignore their legal authority to ensure the public interest comes before corporate profits.